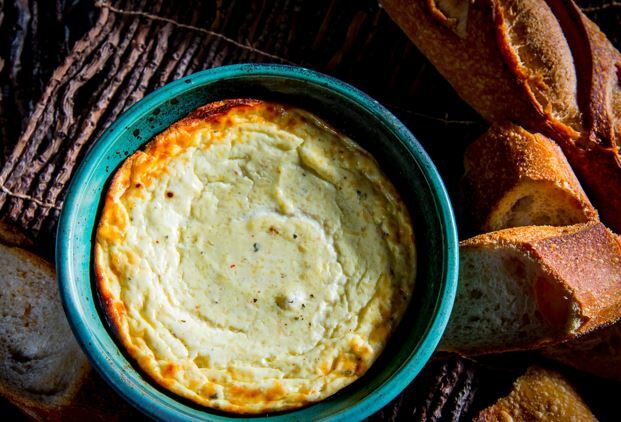 This makes a rich warm cheese dip with a light, airy, soufflé-like texture can’t be beat for any occasion. In addition to crudites its delicious served to top a salad, pasta or whatever. My favorite ricotta is from Bellwether Farms www.bellwetherfarms.com which you’ll find in good cheese shops. Preheat the oven to 400°F. Generously butter a 2 cup baking dish or piece of oven-safe pottery and set it aside. With a food processor add all ingredients except butter and pulse until smooth. Scrape the mixture into the buttered dish, set the dish on a rimmed baking sheet and bake for 25-35 minutes, or until puffed and golden brown. Let it rest for 3-5 minutes before serving hot with crusty bread, crackers, or vegetable sticks.